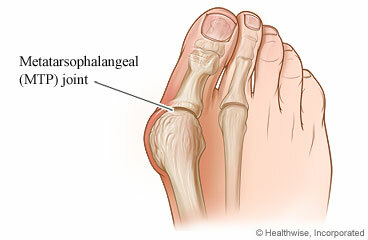 A bunionectomy is surgery to remove a lump of bone from your foot. This lump is called a bunion. It forms on the joint where your big toe joins your foot. The surgery will also straighten your big toe. Your doctor will make one or more small cuts near your toe joint. These cuts are called incisions. The doctor will remove small pieces of bone and may straighten your toe. This is done by cutting the bone and setting it in a new position. Your toe may be held in place with pins, screws, wires, or staples. These may stay in your toe. Or they may be removed after a few weeks. The surgery will leave scars that fade with time. The surgery may make walking easier. It may reduce stiffness, pain, or swelling in your toe joint. It may also improve the way your toe looks. Your doctor will give you medicine to help you relax and to numb your foot. Or you may get medicine to put you to sleep. You will probably go home on the day of your surgery. If your surgery is more complex, you may need to spend the night in the hospital. How soon you can put weight on your toe depends on how complex your surgery is. It may take 6 weeks or longer before swelling goes down and you have healed enough to return to your normal routine. You may have some swelling and pain for as long as 6 months to a year. Tell your doctors ALL the medicines, including natural health products, such as vitamins, supplements, and herbal remedies you take. Some of these can increase the risk of bleeding or interact with anesthesia. If you have an advance care plan, let your doctor know. If you don't have one, you may want to prepare one. It lets your doctor and loved ones know your health care wishes. Doctors advise that everyone prepare these papers before any type of surgery or procedure. Wear clothing that is easy to put on and take off. You may have a large bandage on your foot. The surgery will usually take about 1 to 1½ hours. If you are having both feet done at once, it may take 2 to 3 hours. Enter Y831 in the search box to learn more about "Bunionectomy: Before Your Surgery".